Exciting news! 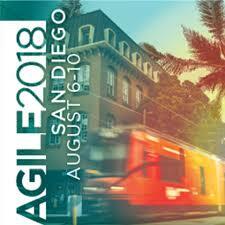 My session on Coaching Heuristics has been accepted into the program of Agile 2018 in San Diego. It’s tentatively scheduled for Thursday morning August 9th. The full title of the talk is Coaching Heuristics: What’s in Your Tookit?, and we’ll be using the Agile Coach’s Toolkit deck for most of the talk and exercises. I’ll bring several decks (>20) to pass out to participants, and plenty of PDFs for anyone who doesn’t get the actual deck. Does a carpenter go to work without a toolbox or a an angler go fishing without tackle? Of course not! So why would a coach show up without her own tools of the trade? Join us for a copy of my list (56 documented, and growing). I’ll share how I use them and where to find the original IP for each. We’ll also dive deep into several with some coaching role-play. See you at in San Diego for #Agile2018! Our first three decks are now back in stock. Enjoy all the original topics in conversations with friends. 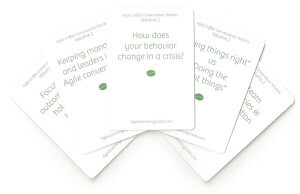 Act now, and when you purchase the three-volume set, receive a complimentary deck of the Agile Coach’s Toolkit. To ring in 2017, I’m unveiling the newest deck from Agile Coaching Cards: the Agile Coach’s Toolkit. This deck is something I’ve been developing for at least a couple of years, and it wasn’t until launching the kickstarter campaign that I saw the possibility of creating it. Yep, this is the deck from the fourth stretch goal. So I told a couple friends about this new deck, and they had questions. So to answer their questions, allow me to share my description of the new deck. What’s in a coach’s toolkit?? 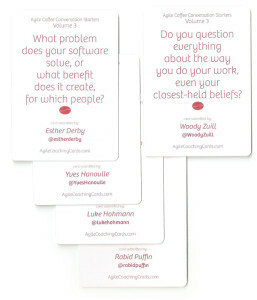 How about the agile coaching cards? What’s the difference? 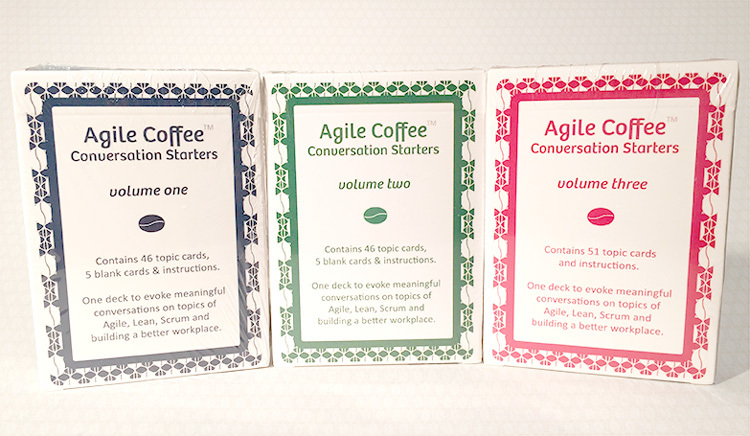 The first three decks (Agile Coffee Conversation Starters) are lean coffee topics. Each volume has 46 to 51 topic cards plus a few support and blank cards to make playing easy, nimble. 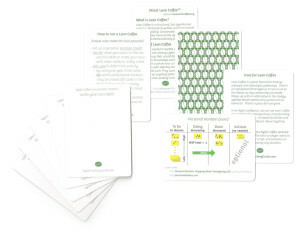 Topics are printed on the face side of the card, and a coffee bean design is printed in one of three colors on the back. I’d been amassing topics for several years of meetups, so it was simple to curate my/our favorites. Printing hundreds of decks at the expected quality required a kickstarter boost… and those great boxes they come in were a bonus. This new deck, on the other hand, is a collection of concepts that coaches should know – a toolkit. 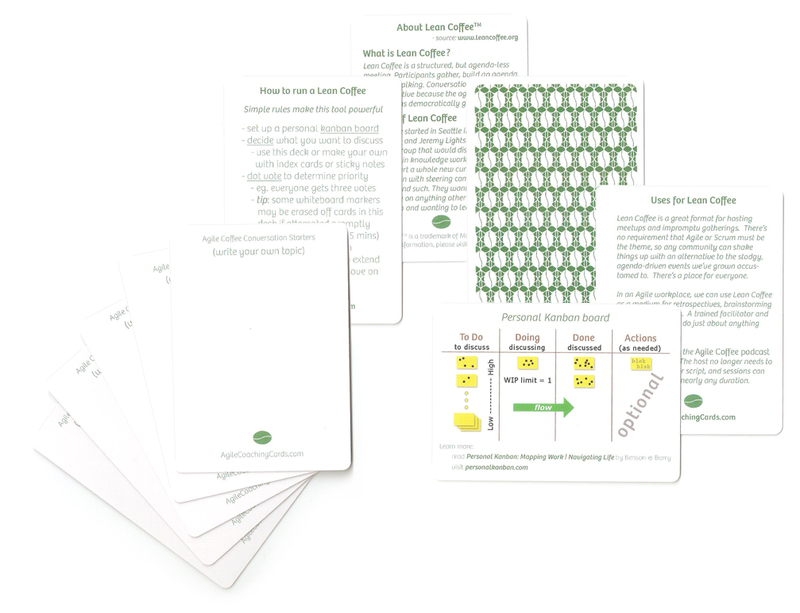 I kept the design consistent with the original lean coffee decks, but added this fourth color. Instead of a coffee bean design on each card back, these are flash cards with information on both sides. Title/author/link on one; a drawing, chart or statement on the other. Recreated all graphics in a consistent style, font and color palette. These also come 54 cards to a deck, and the box fits this set right in with the original three. Can I venmo / paypal you?? No. 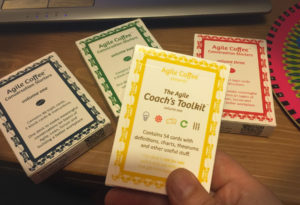 I cannot and will not sell this current batch of the Agile Coach’s Toolkit. I printed them for me and now just give them away to friends, Kickstarter backers, and other random folks. The Toolkit deck has certainly been a labor of love, something I’d been ideating for years. These concepts printed onto cards makes for easy access; repeated practice breeds familiarity – something a coach could call upon “in the moment”. By producing this deck, I am becoming more proficient in the awareness and exercise of these ideas as they pertain to my coaching stance. How can I get a deck? Well, unless you’re a kickstarter backer, I’m not sure how to answer that one. I’ll be sending out the decks to backers over the next month or two (slow drip), and I’m also passing out a few to local friends. Basically I’m too busy and cheap to be mailing these all over the world, but that doesn’t mean you can’t get one. Are you attending the Global Scrum Gathering in San Diego (a.k.a. #SGCAL)? If so, look for me there. I’ll be sure to have a couple dozen on me. Otherwise, look out for tweets or announcements on this site. You’re bound to get lucky, right? 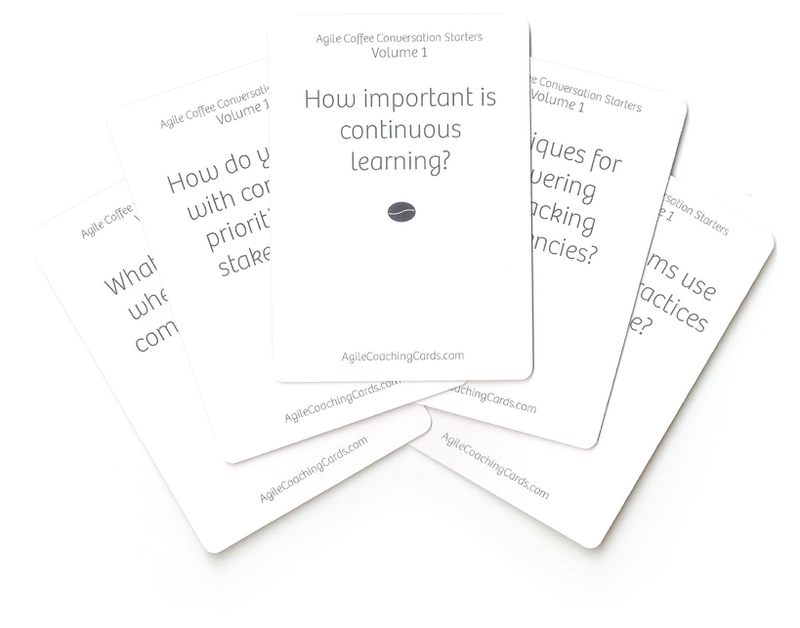 As for the original three decks of Agile Coffee Conversation Starters, the initial printing was a success and has sold out. I plan to make another order very soon and put them on sale by April 2017. We’re Sold Out. More decks coming soon. Gratitude and happiness. Thank you to all who supported the first edition of the Agile Coffee Conversation Starters. All three volumes are officially SOLD OUT at this online store. 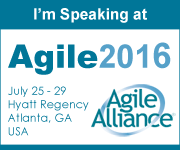 But if you’re going to Atlanta, the store at Agile2016 will have a limited quantity of all three volumes. 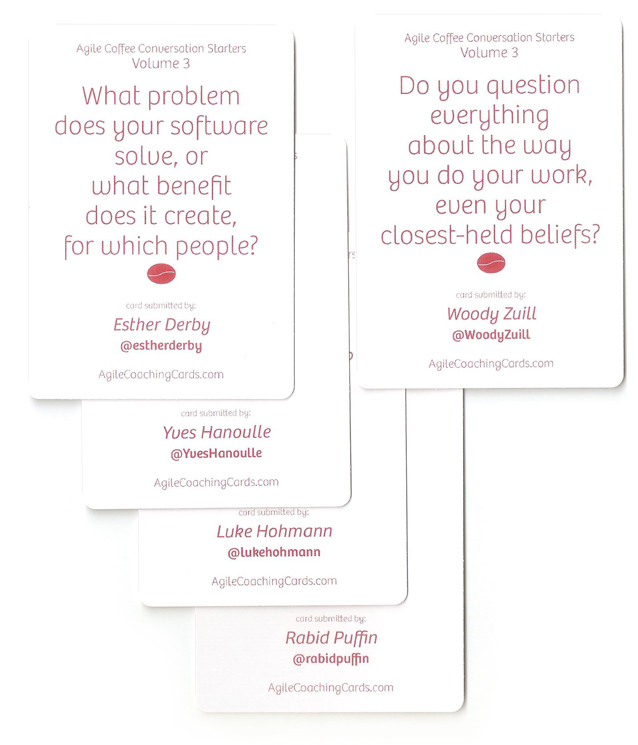 My goal with these cards has been to get lean coffee groups around the world having meaningful conversations. Today I can happily boast that these cards are represented in over 15 countries spanning five continents. 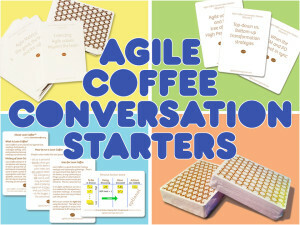 Volumes 1, 2 & 3 of the Agile Coffee Conversation Starters will become available again later this year. 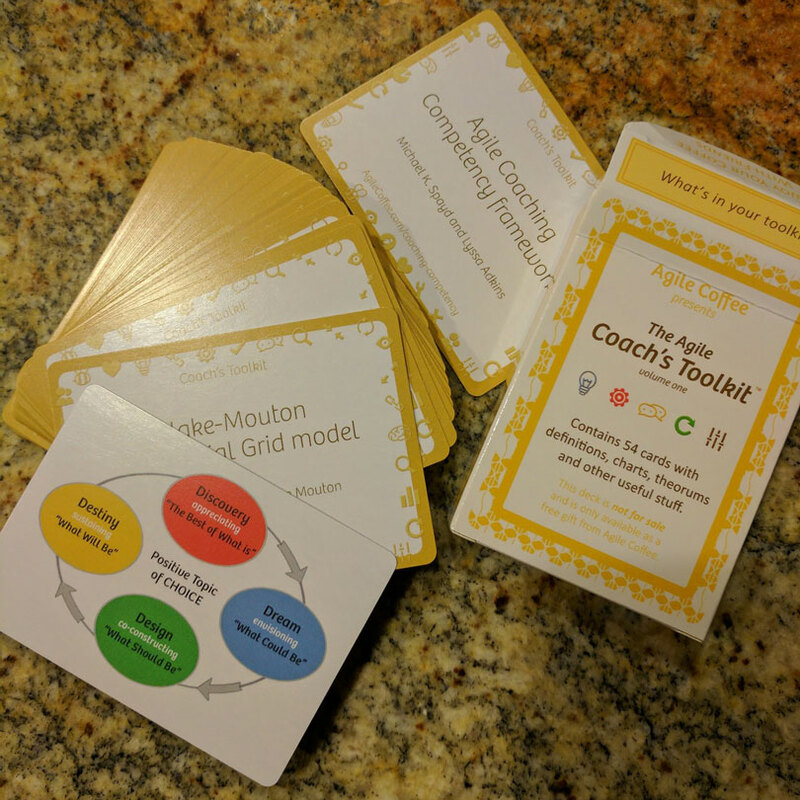 I’m also developing a new deck – the Coaches’ Toolkit contains over 50 laws, models, heuristics and ideas – and I’ll be previewing it at Agile2016. Come find me for a sneak peek. 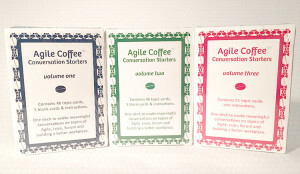 Volumes 1, 2 & 3 of the Agile Coffee Conversation Starters each contain 54 elegant cards per deck. The first two volumes are made up of the best topics from over three years of lean coffees and the Agile Coffee podcast. 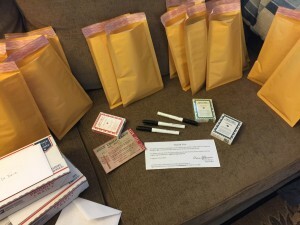 Topics making up volume three were contributed by Kickstarter backers and agile thinkers (and organizational psychotherapists) from across the globe. All cards are laid out using the Bree font family and a one-of-a-kind coffee bean motif (designed by Matt DeSio), and each volume is set in its own color (blue, green and red). The Kickstarter campaign has ended, and the decks have been printed. Beginning today, we’ll be sending out decks* as rewards to all backers (levels 3 and up) of the initial project. Shipping arrival dates may vary, but everyone should get their decks by November 20, if not much sooner. In a couple weeks (~Nov 22), we will open up this site for sales of our first three card decks. If you’ve received a deck and want to purchase more, Thanks! Please check back soon or sign up for our email updates to get the latest news. Thanks to over 30 backers, we have surpassed our funding goal on Kickstarter. That means that these decks will be printed and shipped with priority to sponsors. But we’re not done… The opportunity to fund these awesome card decks runs through September 24th. … and we’ve just announced our first add-on (free to all backers), so don’t miss out. You can go to the Kickstarter page to fund the project and stake your claim on a reward. Thank you.